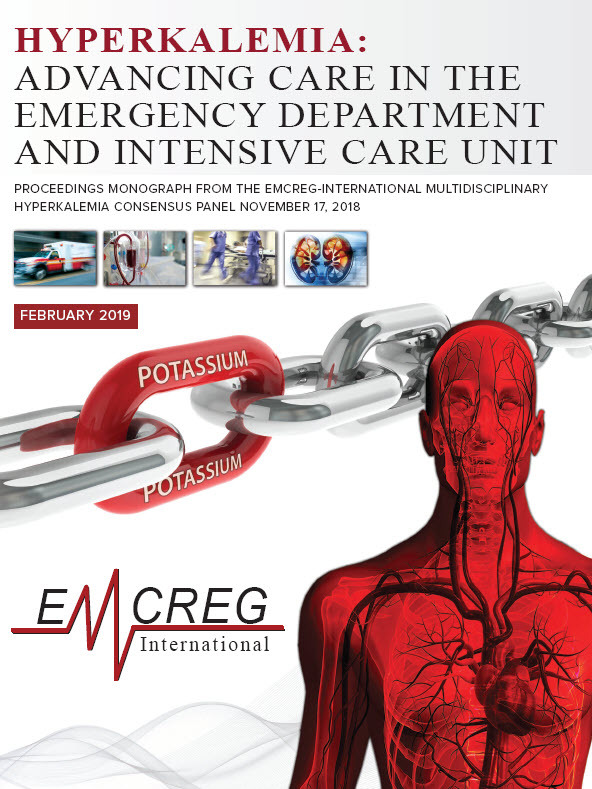 This EMCREG-International Proceedings Monograph contains multiple sections reflecting critical input from experts in Emergency Cardiovascular and Neurovascular Care, Pre-hospital Emergency Medical Services, Emergency Medicine Operations, Nephrology, Hospital Medicine, Neurocritical Care, Cardiology, Medical Critical Care, and Trauma and Surgical Critical Care discussing the treatment of hyperkalemia in an approach we hope the reader will find extremely practical and clinically useful. These expert specialists will describe the implications of managing hyperkalemia in their field with patients in the Emergency Department, Critical Care Units, and the Cardiology Clinic. Finally, an EMCREG-International Hyperkalemia Consensus Panel algorithm for the approach to management of patients with life-threatening hyperkalemia is provided for the clinician and can be expanded in size for use in a treatment area such as the Emergency Department or Critical Care Unit.